I play too many games… this is a blog about them! I’ve been making great hobby progress in 2019. I don’t think the Bingo card is the reason, but it certainly helps to quantify some of the progress. This time I’ve completed the top-left corner, with this simple conversion. I had a couple of spare Acolytes from Deathwatch: Overkill and I liked the look of the Kelermorph model. 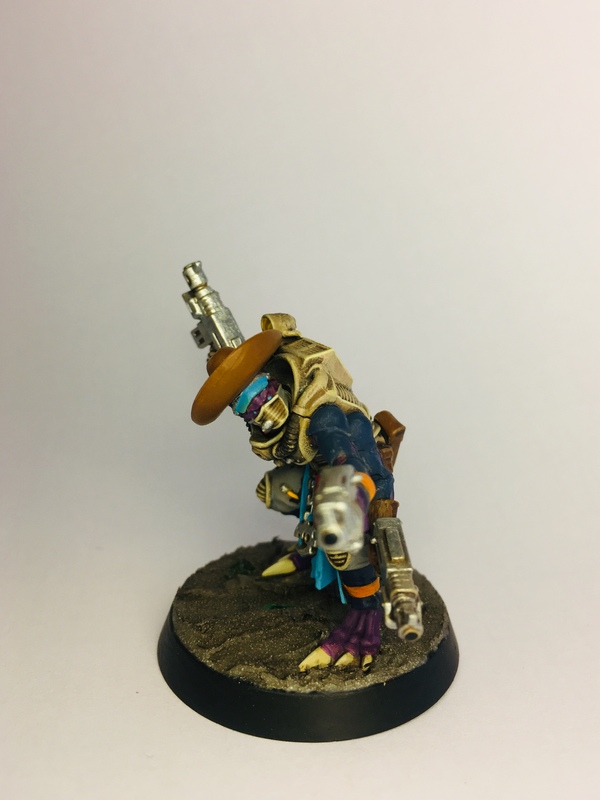 A few simple hand/gun swaps and was ready to paint. I showed a photo of it to Phil before undercoating it and he suggested the cowboy hat. I happened to have one on a sprue from a Malifaux model, so I thought ‘why not?!’. I completed an Iconward and 15 Genestealers (bringing me to 50 in total!) at the same time. Two of those models have been undercoated for over 25 years(!! ), so they could definitely count as the ‘Finish painting a model that’s been in your to-do pile … for more than a year’ square! I might add it next time I edit the Bingo card. I also plan at least one more conversion as part of my current push with the Genestealer Cults, so that’ll be another easy square. Copyright © 2019 Wargames @ farfaraway.org. All rights reserved.